do you have to download all that programs? How i do the infinite loop in my midis for the worlds? Hey, Crist there, since it's my first post i want to say hello to all. Gotta two questions about music hacking. How I can make loops in my music. I mean do i have to do it manually via hex editor or is there any simplier way. I read that there's way to do this by Anvil Studio by add markers but it didn't work. And second one. How I can replace sound_data.sdat file. I mean everytime i pick Replace file option i get two sets of same data. I worked today whole day on changing music for castle theme (find NSMB Wii castle theme), I know it works file because when I open VGMTrans I can hear my theme but it don't loops (as I said previous). I'm just asking because I decide to move back to my old NSMB project (called SMB Bowser Revenge). Thanks . It was a while since I had worked at NSMB. I've worked a lot at NES games, I'll show something but on other topic. 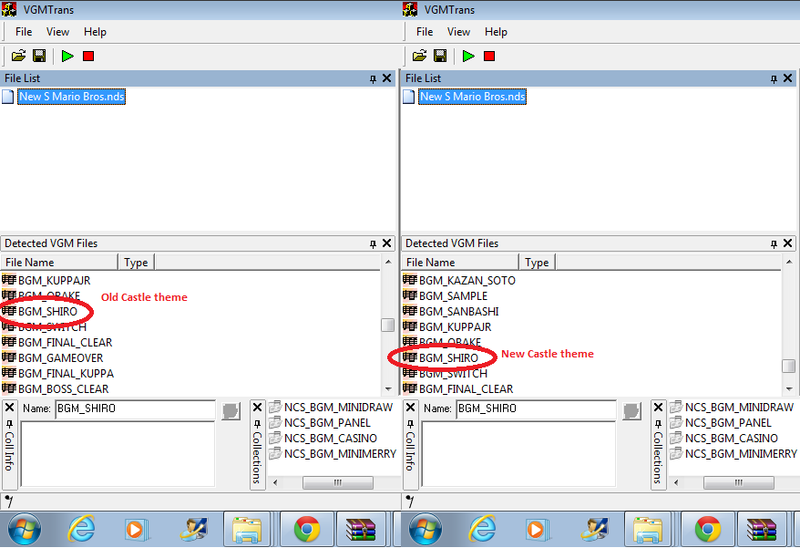 I do as you said, turn on NSMB editor, click replace file, choose new sound_data.sdat and this is what happened. I mean I got data about 2 versions of every song. And since it's no problem for music that I didn't change, when I turn on my DS and try to play Castle stage i hear no music (since there's 2 sseq files for each song). So If i set Castle theme for Castle, game don't know if to play DS version or Wii one (mean the one i made). If it would help, I can upload my modified version of sound_data.sdat with new theme. Yeah it's pretty odd. I tried many thing (Compress, Decompress, even try to make some changes in Hex code but it didn't work as well). It's just like the old sound data is not rewriten but save alongside with new data. I think if it would be possible to just remove old data first totally from Rom and then just put new data into it. PS: Maybe there's any other programs that allow to change and replace data in DS roms? PS2: Problem resolved. Just used NitroExploer 2b and now there's only 1 data for 1 music, mean everything ok but not. I mean I can't still hear music even if everything is ok and i can hear it on VGMTrans while i can't on DS. I followed the steps in the tutorial (replace victory theme with one from SM64DS),but when I tested it in the emulator,the normal music still played,even though I replaced the files and I replaced the sound_data in the rom with the sound_data I made! I know I replaced the right files,and all other music is unchanged,like I didn't do anything. But when I tried to do it again,I noticed that the sound_data that I made using the NDS editor is 0 bytes in size! How do I fix this? I do all the steps but every time,the new sound_data is 0 bytes big. Help! Mmm... I extracted all files in .sdat. And then, I made a new .sdat without any change to files. But the new .sdat can't work well. How should I do for it please? I searched one compleate hour, but I can't find wav2swav.exe and swav2swar.exe. If you have a download link please share it. i can't convert my midi to sseq i want to change nsmb beta music with yoshi new island overworld midi but it doesn't show the sseq file, what do i have to do ? When I said "C:\Users\MY NAME>E:\nsmb-editor-376\SSEQPlayer_demo\midi2sseq X.mid Y.sseq",midi2sseq said "Error: Invalid MIDI file!" My midi file meets the conditions to convert. But,midi2sseq said "Error: Invalid MIDI file!". You've got an older version of VGMTrans. In the version you've got, the option 'Export as original format' isn't available. Edit: Click here for the new version. Could you put a link to the newest one right there? Done exporting, but what's the best app to reimport the exported files?